Rally Racing News Leader in the USA | Rally World News Rally World News: Flying Finn Marcus Gronholm Dominates at Global RallyCross #1, While Jimmy Keeney Walks Away From the Big One. 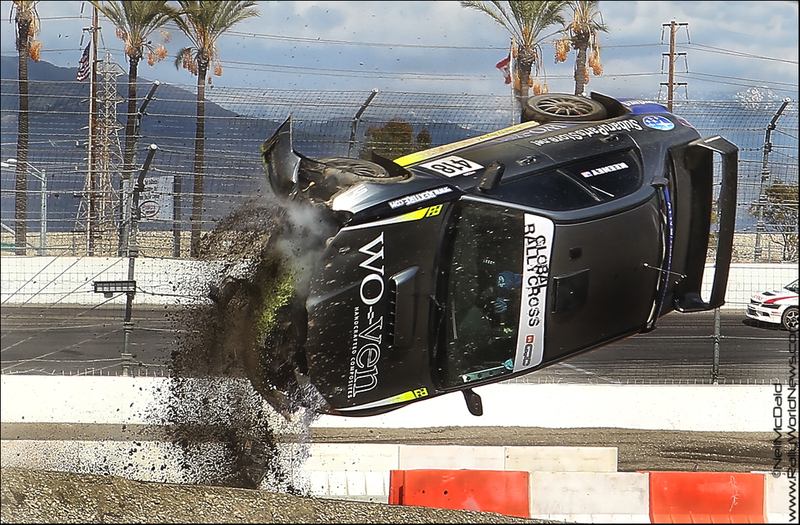 Flying Finn Marcus Gronholm Dominates at Global RallyCross #1, While Jimmy Keeney Walks Away From the Big One. Irwindale CA, March 26, 2011. As round number one of the Global RallyCross Championship got underway on Friday morning, it quickly became apparent that we were going to witness a master class in driving from WRC Champion and Flying Finn Marcus Gronholm. 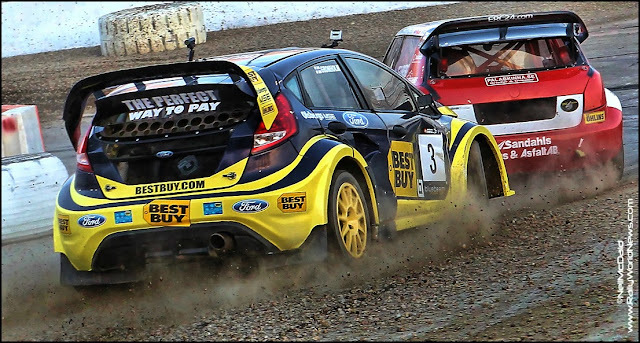 Marcus, who teamed up with Best Buy and Ford Racing for the inaugural round of the Championship would dominate on both days of competition, taking his 2011 Ford Fiesta to the top spot on the podium in both Super Rally and RallyCross. 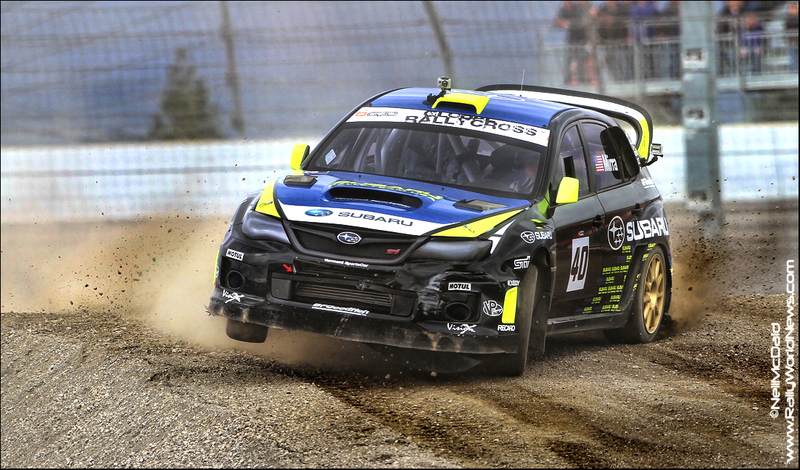 Considering the short amount of time from when we had confirmation that Global RallyCross was a go, the organizers did a bang up job in pulling it all together for the first round. With a mountain of dirt trucked into the infield of Irivindale’s Toyota Speedway earlier in the week, it was all hands on deck to get the course set in time for competition. Adding to the already tight schedule, wet weather in the area in the days just prior to the event hampered in the construction of the Gap Jump bringing things right down to the wire as the teams arrived. The 70 foot Gap Jump was to be the main feature of the course layout, with a smaller second jump thrown in for entertainment value. Several hundred concrete and plastic jersey barriers would form a maze in the infield, which drivers would navigate to complete their laps. Not so much in the AWD class, for Art Gruszka, Jimmy Keeney and Joseph Burke who showed up in their regular stage rally cars, it was kind of like bringing a knife to a gunfight. They were down by as much as 200 HP to the RallyCross specific cars, nonetheless undeterred they fought well with what they brung. Leading the charge for the Americans was Tanner Foust in his RockStar Energy / Ford Racing backed AWD Ford Fiesta. Foust volunteered to take the first pass over the jump to determine the optimal speed to clear the gap. The approach speed to the jump is critical, too slow spells disaster as we have seen in the past at XGAMES, and would unfortunately witness again at this event. Day one would get underway with Super Rally, a racing format developed for XGAMES competition. Despite the best efforts of the announcers, the fans in the stands struggled to grasp the concept of the super rally. I have to say that it can get a bit confusing at times to understand where things are at. Down time between runs was extremely tedious, granted this should improve as more cars enter at future events. A moment of high flying drama during the AWD eliminations had the fans on their feet in awe. While chasing Marcus Dodd in the Hyundai Veloster, Jimmy Keeney from Colorado would disintegrate his pristine Subaru STI over the jump. Jimmy made a late gear change as he approached the gap jump ramp, which dropped his approach slightly below the required speed. He just about cleared the gap but his rear tires would clip the edge launching the car back into the air followed by several end over end flips before the mangled Subaru came to rest at the bottom of the ramp. There were a few tense moments before Jimmy emerged from the side window of the car. The Irwindale track rescue teams sprang into action and were with Jimmy within seconds of the car coming to a rest. Although the car was a total loss, Jimmy’s safety equipment performed as planned and thankfully despite been a little sore from the belts Jimmy walked away from this massive wreck to race another day. Onto the quarter finals, America’s rising rally star Joseph Burke would throw down a massive drive against Sweden’s Mikael Jernberg. Jernberg who is one of Europe’s top professional RallyCross drivers has decided to forego racing in Europe for a year and contest the new Global RallyCross Championship and XGAMES. Burke’s Mitsubishi Evo was clearly drastically down in power to Jernberg’s angry little Skoda, but it did not deter young Burke from hounding the old hand around the course. Jernberg would eventfully take the win over Burke and go on to edge out Tanner Foust in the semi finals. Jernberg would now meet WRC legend Marcus Gronholm in the final who despite having a slight mechanical glitch on the start line of one of the heats breezed his way through to the finals. Apart from Jimmy’s big moment, the SuperRally final was the highlight of day one, Gronholm and Jernberg would go at it hell for leather. Jernberg getting a nose ahead on Gronholm on the opening lap but it was only a nose, Marcus was on the attack. The pair gets into each other at the bottom of the jump ramp, Marcus would power his way through and edge out Jernberg for the lead. Despite continued intense pressure from the Jernberg, Marcus would take the overall victory in Super Rally. 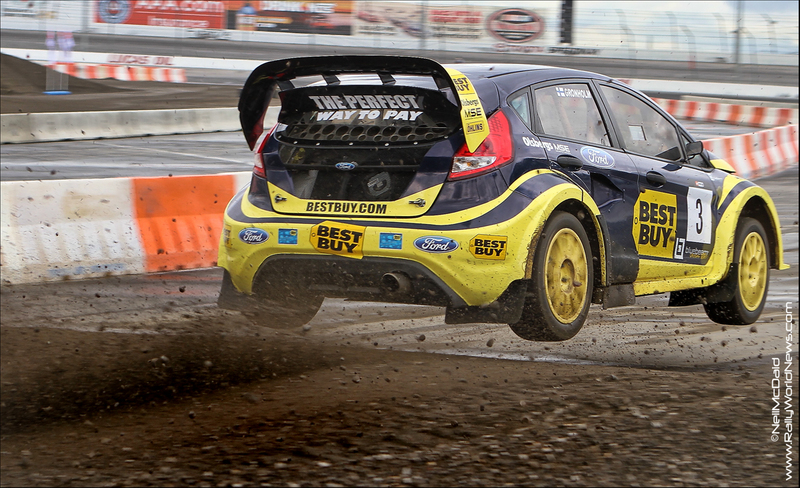 Tanner Foust would claim third from his placing in the semifinals. The course layout for the 2WD cars excluded the large gap jump, but the small jump on the second dirt section inflicted some front end damage on the 2WD cars as the battled the clock in qualifying, before it was flatten out some by the track crew. Dillon Van Way and Tyler TurnBull both in Ford Focus’s along with Randy Zimmer and Matthew Johnson who were both in the Mazda camp all advanced from qualifying to the 2WD Final. In the final, Van Way got the edge and ran with it to the finish line, Matthew Johnson steered the Mazda RX8 to second, and while a very elated Randy "Zoomer” Zimmer brought his very unique Miata home in third. Despite the lack of HP, traction and any sign of sponsors, the 8 drivers entered in 2WD gave it their all on every lap. Day two, we move from Super Rally to the RallyCross format, the track layout out gets a slight tweak by the organizers to reduce the risk of impact after the jump. We also are delighted to see the arrival of Dave Mirra and Team Subaru for day two. For some unknown reason beyond our information level, Subaru decided to sit out day one. After a few practice laps, we would jump right into the 2WD heats. Dillion Van Way would set the early pace, with Andrew Sutherland in the Honda Civic in second and Matthew Johnson in third. Sliding over from Formal D, drifter Chris Kregorian showed up Saturday in his twin turbo spinning Nissan 350Z to get in on some of the RallyCross action. Andrew would grab forth in the first heat. Dillion Van Way would also take heat #2, with the Kregorian moving up to second and Randy Zimmer moved to third. Matthew Johnson, tried his best to grind the passenger’s side door handle off his Nitro Circus sponsored Mazda as he clipped a tire in the heat of battle and slide over the finish line on his side. Somehow the car managed to drop back on all fours; Johnson fired it up and returned to the pits. Whether it was from the bump landing or some other little gremlin working its way into the RX8, Johnson’s car decided it would stay in second gear. Despite all kinds of tugging and pulling it was locked in. Not wanting to give in just yet Johnson would complete the last heat in 2ND gear, while others had issues Matthew somehow managed to make to the finish line to qualify for the 2WD A-Main. There was no want of drama when the AWD cars started the heat races, five of the ten starters DNF’ed in the first heat. Dave Mirra misunderstood the starting system and failed to launch in his heat, Art Gruszka tagged a barrier which stopped his run. But it was Joseph Burke who brought the fans to their feet in the early going. Burke while running second to Hyundai team driver Rhys Millen come into the gap just a little too hot, he clipped the bank performed a perfect mid air flip and landed his Evo on the guard rail. “it’s hard to back off when you’re so close to a victory even it’s only a heat race, I was right there with Rhys coming into the gap, the rear end just stepped out, I thought I had it recovered enough to make the turn, but over she went, I fired it up right before it landed but it was caught up on the rail-bummer” it would take some creative work by the tracks recovery crew to get Burke stricken Evo off the guard rail. 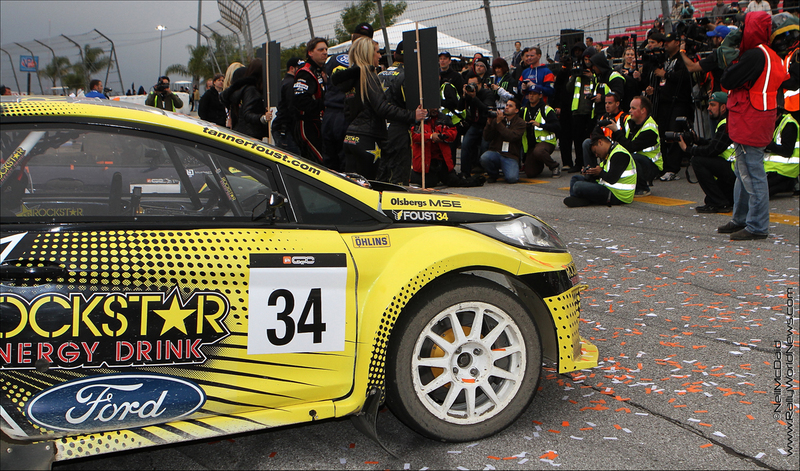 Marcus Gronholm took the heat #1 victory, trailed by team mates Tanner Foust and Pontus in third. The Ford’s of Marcus Gronholm and Pontus Tidemand would falter in heat #2, and DNF. Because of damage sustained in his earlier roll, Burke would have to sit out heat 2 while his crew rushed to repair the car. 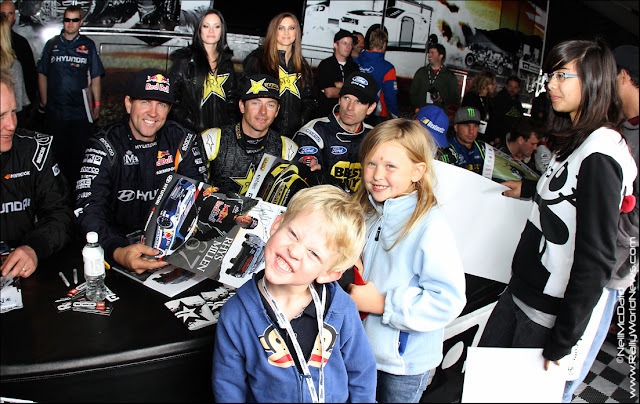 Tanner Foust took the victory in heat #2 with Hyundai Team mates Rhys Millen and Marcus Dodds finally getting a good showing in thier beautiful new Velostar’s. Heat # 3 seen a return of the Ford men to the top of the sheet, Marcus, Tanner and Pontus made it 1,2,3,. 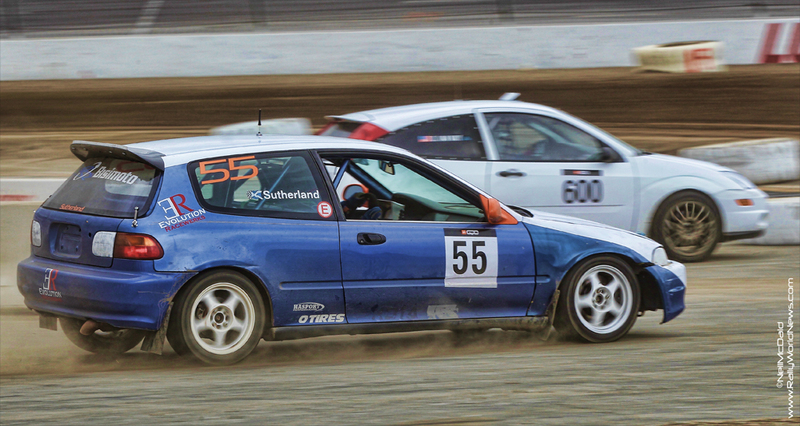 Stephan Verdier in his Crawford powered Subaru was pushing hard to took forth. With the heats and the b-mains behind us it was onto the finals. For some strange reason the crew can always seem to eke out just a few more horsepower from the cars for the A-Finals. As the 10 minute warning was giving to the 2WD drivers to report the start line, all kinds of drama was going on under Johnson’s Mazda, I think I counted 5 pair of feet sticking out from under the RX8 at one point. The car was still stuck in gear; Matthew was keeping us posted via twitter, “Bummed, car stuck in 2nd gear....running out of time. Might have to try to compete in 2nd and givr” but @mjrally quickly follow up with “Holy cow, just got ma' gears back! Thanks Odi at FEAL suspension! Ready to rock I think” yes indeed MJ was back and ready to rock. 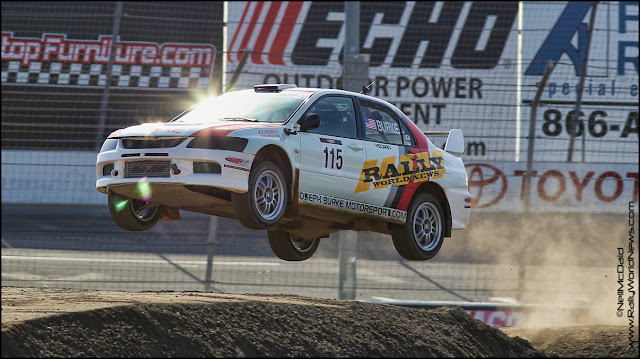 On to the climax of two long days of racing, the AWD, A-Main, I have to say there are few things in motorsports that can compare to the standing start of the AWD cars in RallyCross. Not to make lite of the situation in Japan, but I swear I felt the earth shutter as the cars launched. It was Marcus Gronholm with the edge as they rounded turn one at Irwindale speedway, closely flanked by team mate Tanner Foust and privateer Stephen Verdier. With Pontus Tidemand leading the second pack of Dave Mirra and Rhys Millen, all three headed towards the jump.Marcus would maintain his lead over Foust as the laps counted down, Pontus Tidemand who was rubbing bumpers with Stephen Verdier for third pulled off to the side on the front straight in the closing laps with mechanical issues. .
Stephen Verdier would find an opening and passed Foust for second, which he held for a half of a lap, before Foust grabbed it back. In the end it was all Marcus, he just seemed to be able to turn it up a notch when needed taking the overall victory on both days of the event. Tanner Foust would keep Verdier at bay and held second. By taking third, Stephen Verdier proved there is a place on the podium in this sport for the privateer, as he beat the factory supported teams from Subaru and Hyundai. Crews will head north to Seattle for round #2. It’s doubtful that we will see Marcus Gronholm in attendance, but it’s not out of the question. Most of the competitors that ran at Irwindale seem set to compete in Washington. Hopefully we will see a few more drivers jumping into the 2WD battle. 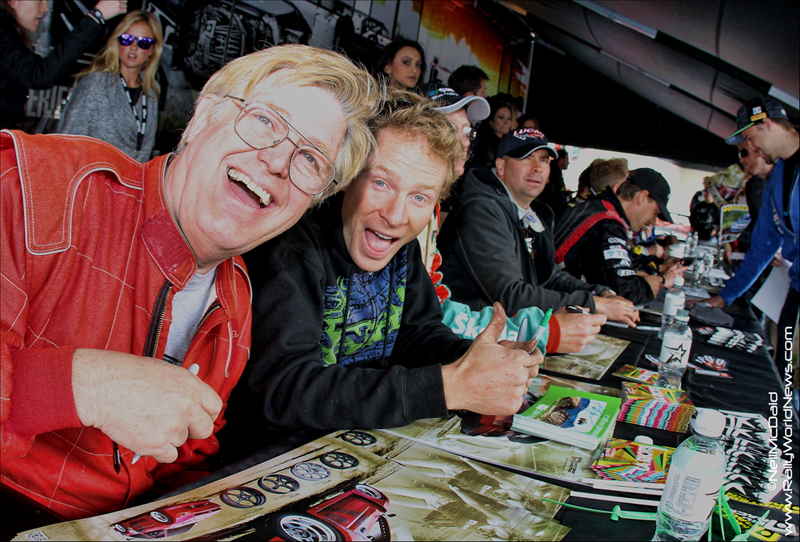 Stay tuned for more info as it becomes available; also check in with http://www.global-rallycross.com/ for the most up to date info and tickets.